Bryan Scott and Kellen Heard returned to the fold in practice Saturday, but one had a heavier workload than the other. Scott, who missed Friday’s practice with a thigh contusion, was back practicing in full on Saturday doing all team work. Heard however, only participated in individual position drills coming off of an ankle injury that kept him out for a week. Having missed most of the spring practices due to the same ankle being injured, team doctors examined Heard’s ankle further to see if they had missed anything in their diagnosis. Gailey got that report back. The Bills defense will have 2 players back from injury in the fold. Bryan Scott is back from a thigh contusion and Kellen Heard is back from an ankle injury. We’ll update their level of participation as practice wears on. There’s a new non-participant at practice today. Bryan Scott, who was limited Thursday with a thigh contusion, is not practicing at all today. Along with him on the sidelines are Justin Rogers, Josh Nesbitt, Kellen Heard, David Nelson & Chris Kelsay. With major free agent moves rolled up in the Mario Williams signing we’ll be looking more toward the draft for big additions, especially at pick 10. There could be a minor signing or two, likely one of Buffalo’s own FAs. We’ll see. In the meantime let’s get to your questions at AskChris@bills.nfl.net. After seeing Brad Smith pick up more than a handful of 3rd and short conversions early in the season last year, it seems as though the offense scrapped that formation because of the lack of depth at the WR position and need for smith to line up there (and reducing wins dramatically). Are the Bills planning on using the “wild bill” formation again for short yardage for the upcoming season. Also after showing lots of potential at the outside receiver last preseason, is Marcus Easley healed and ready for this season? CB: I believe that Brad Smith’s role in the offense will be expanded. Chan Gailey often lamented the fact that with free agency crammed into a two-week span right before training camp opened that there was no time to incorporate Smith’s talents into the offense. You’re right he was pretty effective converting short yardage situations as the Wildcat QB and I would expect that is still a part of the offense. It’s possible he could line up at wideout at at times, but as long as the receiving corps stay healthy I believe Buffalo’s offensive staff have some other ideas in mind. As for Easley, he’s one of those receivers that’s likely to allow Smith to focus on running plays from the quarterback position at times than receiver. He’s medically cleared from his condition, which has been effectively medicated and all indications are that he’ll be ready for spring workouts. What do you think of Michael Brockers, DT, LSU?? Is he good enough size wise and speed wise to convert to DE and be the answer to the Bills need for Pass Rusher?? He could be the surprise answer to this very important need, rushing the passer….. How does he look at the Combine?? CB: He’s strictly a DT. He’s not capable of moving outside to play defensive end in a 4-3 defense, which is what Dave Wannstedt is running. He’s also a young player coming out early and needs some development. He has a ton of potential and will probably be a top 20 pick, but he is not an end. Ran a 5.36 at the Combine. First of all thanks so much for answering the fans questions its really nice to know everything that goes on with the Bills. With that i wanted to know that if the Bills had plans to add a QB to the roster before trianing camp? also if the Bills get the pass rusher they want as a free agent and bring back Stevie, is there any way they trade up for RG3? i heard the Bills interviewed him at the combine and was just wondering if it was possible to get what looks like a great player in RG3? CB: Buddy Nix said drafting a quarterback is always possible because you can never predict if the right one for the value on the board at the time is going to be there. Yes, they visited with RGIII, but trading up to get him is not going to happen per Nix. Buffalo’s GM doesn’t like to part with picks and you saw the king’s ransom Washington coughed up to move up there. The Bills also interviewed Brock Osweiler so there are going to be several QB possibilities in the draft. The question is, does the right one for the Bills show up on the board when they’re on the clock? That’s the only way it happens. Sitting at number 10, I feel we will have a lot of options, not only in the pass rush department , but at tackle, receiver and corner as well. Any of those positions offer some pretty appealing players. I know it’s impossible this early to say what will happen, but who has caught your eye in Indy this week? I hear the receiver crop is pretty deep out there. CB: I think there’s good value at offensive tackle at 10. Iowa’s Riley Reiff and Stanford’s Jonathan Martin could both be on the board at that time and I think offer good value at 10. I don’t believe there’s good value at 10 for the pass rush, which may explain why the Bills pushed so hard to land Mario Williams in free agency. Assuming LSU’s Morris Claiborne is off the board prior to the 10th pick I don’t see good value at 10 at cornerback. Wide receiver is a possibility, but it’s hard to know if the Bills believe a prospect like Notre Dame’s Michael Floyd is worthy of the 10th pick in terms of value. The receiver crop in the draft is deep, but there aren’t many speed merchants. Big-bodied players, but not many that run exceptionally well. That’s why the value at the position is between rounds 2 and 4. When I was at the combine I was very impressed with Martin the OT. I wouldn’t mind them taking him at 10th overall. What is the talk about Bryan Scott? I think he is a big part of the team. Not only on the field, but off the field as well. He is a great role model and would love to see him re-signed by the team. Do you have any insight on this. CB: No question Bryan Scott played an important role for the Bills in their nickel package last season and is a model citizen off the field. Buddy Nix told me earlier this week that the team made him an offer, but had not heard back from Scott’s camp. He’s a free agent now. Scott has told me that Buffalo is his home as he sees it so he’d obviously like to be back. I wonder if the Bills new 4-3 defense changes his value to the club defensively. Though Dave Wannstedt said he wants LBs that can run. In the nickel package Scott could still play an important role. I think the Bills want him back, just at their price. Here’s the list of Bills players that are now on the free agent market after not being re-signed by Buffalo prior to the deadline. Bills GM Buddy Nix told Buffalobills.com earlier today that the team made contract offers to Bell and Scott, but did not get a counter offer back, so he expected them to hit the market. Keep in mind that both players could still re-sign with Buffalo, but they’ll be competing with other NFL teams now. With the emergence and more consistent availability of David Nelson week to week over the past two seasons in the slot, it’s not expected that Roscoe Parrish will be actively pursued by Buffalo. Restricted free agent RB Bruce Hall was not tendered a qualifying offer by the Bills making him an unrestricted free agent as well. Scott to assemble an NFL band? Bryan Scott, who just finished participating in the NFL Business of Music Boot Camp at NYU last week, apparently did some good networking with his music loving NFL brethren. Scott was recruiting other NFL musicians that were taking part in the program including Vikings punter Chris Kluwe. “Kluwe, he plays the bass, the punter for the Vikings. We were talking about it. There are a lot of guys that can really play and obviously we’re football players first. But this is something that can carry on long after the helmet and cleats are hung up,” said Scott. The safety believes drawing from the musically inclined talent pool in the NFL they could put a pretty good group together. As we profiled on Buffalobills.com late last week, Bryan Scott was handing off a pair of Super Bowl tickets to the person that best displayed their passion as part of his ‘Show your Dedication’ contest on his twitter account. 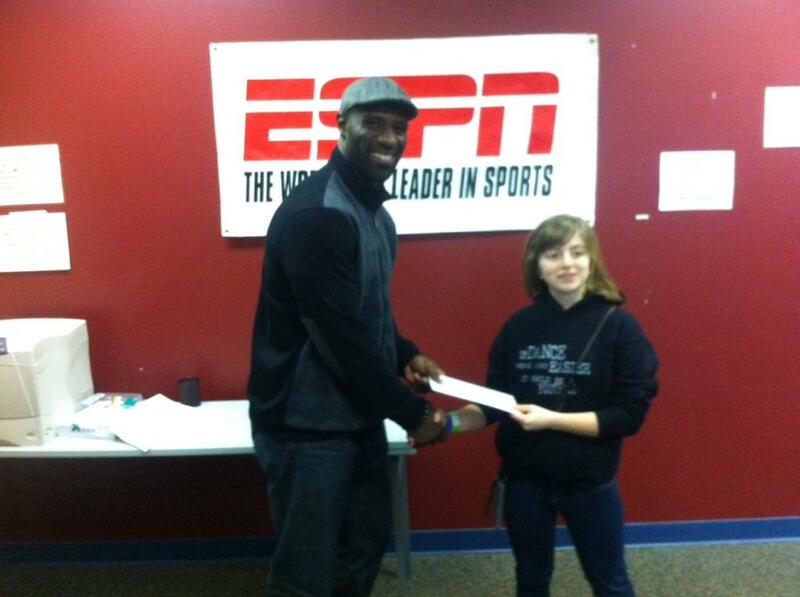 Here’s Bryan handing off his Super Bowl tickets to Sunday’s game to winner and Bemus Point, NY native Lauren Kendrick, age 12. For Kendrick, a devoted ballerina, Super Bowl XLVI was the first pro football game she ever attended in person. She also donated the $5,000 in prize money back to her dance studio. The following statement is being sent on behalf of Buffalo Bills safety Bryan Scott , Penn State alum regarding the passing of Joe Paterno. It’s really difficult to find words that encompass what Coach Paterno will forever mean to me. He reinforced that a man’s character, morals, values and fundamentals were the main ingredient for success. Succeeding in the classroom, succeeding at your job, succeeding at home, should all be placed before success on the football field. The fact that the all-time winningest collegiate coach placed a much higher precedence on guiding his players to a successful life, is indicative of his authentic values and iconic character. He brought great perspective to my life, and I will always and forever take those lessons, live by them, and pass them forward. Bryan Scott has played a hybrid role defensively for most of the season. That could be changing. Scott for the first time this season is doing individual position drills with the linebackers instead of the safeties. Scott has practiced and played at LB in the past with the Bills, but it was due mainly to injury at the position. Here’s the music video for Bryan Scott’s ‘Dedicated’ song that he wrote and performed. Happy Thanksgiving everybody. Bills safety Bryan Scott is a multi-faceted defender playing a hybrid LB/S role on defense. He’s also got some God-given talent as a musician as he’s able to play by ear. In conjunction with his new music single ‘Dedicated’ he’s just released a cool video contest. You can find the video contest at ShowYourDedication.com. His new music single can also be previewed on iTunes. All proceeds from the sales of the single on iTunes goes directly to the Bryan Scott “Pick Your Passion” Foundation for the Arts. Here’s an additional radio appearance coming up soon. Bryan Scott will be appearing on The Fan 590 in Toronto on the Jeff Blair Show @ 11:40 am (listen online). Though the Bills were very unhappy that they let a winnable game slip away Sunday against the Bengals they are not burying their heads. The New England passing game gets all the headlines and why wouldn’t it? Tom Brady had his highest two-game passing yardage total ever, which was also a franchise best with 940 yards through the air the first two games. But Bills fans should not forget what the Patriots running game did against Buffalo last season. New England in the two matchups against the Bills in 2010 rushed for 200 and 217 yards on the ground in their two victories. The lopsided score early in the second meeting accounted for a lot more rushing by the Patriots, as they were looking to shorten the game. And everyone is well aware of the Buffalo’s run stopping problems a year ago. Buffalo’s defensive players that were here a season ago still have a ton of respect for Brady and the passing game, but it hasn’t made them forget what the likes of Ben Jarvus Green-Ellis and Danny Woodhead did to them last season. New England is currently ranked 16th in the league in rushing. Green-Ellis averaged 101 rushing yards in the two meetings last season (202 total). At the outset George Wilson is the starter at strong safety, but there is healthy competition behind him. Veteran Bryan Scott was the strong safety with the second unit, followed by rookie fourth-round pick Da’Norris Searcy. This is one of the few positions in camp that could see a lot of shuffling back and forth before we get to Sept. 11th. With the lockout preventing the players from getting an up close look at the team’s new uniforms, the Bills are getting a better look now that they’ve reported for training camp and on the whole they’re loving them. Bryan Scott was one of the first to react to the new white helmets and royal blue jerseys. teambryanscott Great to be back at camp with the fellas! And the new uniforms are FRESH! Only Lee Evans and Fred Jackson were given sneak previews of the new uniforms as they were chosen for uniform fittings during the planning stages. The new singing competition show ‘The Voice’ on NBC is featuring a performer with a Bills tie. Javier Colon, who appeared on NBC’s Today Show last week, performed the national anthem for the Bills’ home opener last season. Colon’s version of Cyndi Lauper’s ‘Time after Time’ was in the Top 100 on ITunes within hours of airing on the program. The show airs on Tuesday evenings at 9 pm ET. Javier Colon is also a friend of Bills safety Bryan Scott, who is an avid musician. ESPN’s Kenny Mayne was in town this week and shot a video piece with Bryan Scott. Mayne tweeted when the piece will air on ESPN. So look for Mayne’s piece some time after 12 noon on ESPN’s Sunday NFL Countdown. With jack-of-all-trades LB Reggie Torbor and DE Dwan Edwards now on I-R and the likes of rookies Antonio Coleman and Alex Carrington helping to fill those voids, Buffalo’s defensive scheme will not have as many wrinkles as it usually does this week. Head coach Chan Gailey explains why. Coleman is expected to handle most of those OLB duties previously manned by Torbor. At ILB Akin Ayodele and Bryan Scott are expected to divvy up Torbor’s ILB duties. And at DE, Spencer Johnson is expected to start in Edwards spot with Alex Carrington rotating in a good deal. The Bills will already be without starting DE Dwan Edwards for the foreseeable future with a severe hamstring injury suffered last week. It looks as though another valuable veteran will also be out for a spell. Head coach Chan Gailey indicated that LB Reggie Torbor is not expected to play this week or any time soon. “It’ll be a long time,” Gailey said when referencing both Torbor and Edwards. Torbor has played an important jack-of-all-trades role lining up at both inside and outside linebacker in the Bills base defense and subpackages. Bryan Scott and Akin Ayodele are expected to step in for Torbor in nickel and base for his ILB duties. Then Aaron Maybin and two rookies in Antonio Coleman and Arthur Moats could be spelling Torbor on the outside.